One of the often-asked questions is: what’s outsourced private medical practice management. That’s not an unreasonable question if you think about it. What is it that’s outsourced? So, the first question, what is outsourcing? Outsourcing may be defined as the transfer of a function previously performed internally, say by the consultant’s medical secretary, to an outside agency or person. Fine, but why? If that person is already performing the task why outsource? It may be cheaper – your practice may not warrant a full time practice manager. The medical secretary may not possess the level of expertise required to perform the task to a required level. This does NOT mean medical secretaries can’t do the task or like doing the task. Med-secs are the unsung heroes of the medical profession in my view. But there is a third reason, a more important one too. The medical secretary has just about enough to do organising clinics, theatres, typing letters to patients, corresponding with GPs, answering a constantly ringing telephone etc. In other words he/she is looking after the patients. Ahh comes the response; my medical secretary can certainly squeeze another hour or so into her week to handle say the medical billing side too!! Really? Have you asked them? More importantly if she can “squeeze” another hour or so in shouldn’t she use those hours to improve the customer service to the patients? Finally of course, are you comfortable letting your medical secretary be responsible for a business i.e. 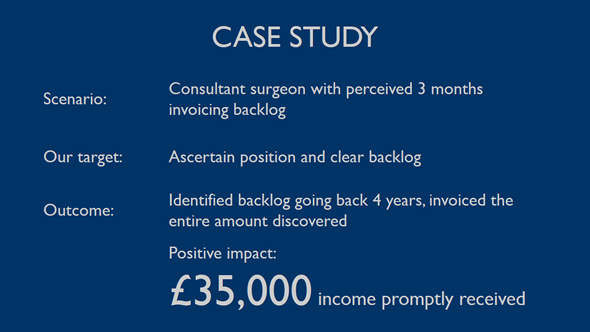 YOUR medical practice and a £100,000+ per annum turnover? Or even £50,000 worth of turnover? The normal response is to say: I agree. I’ll ask Jane to outsource everything that’s a problem. Save of course it’s not that simple! So, secondly, what can be outsourced? Turn it on its head to answer that. What would you like the front office of your practice to look like? What impression do you want to give when a patient writes in or telephones? You want your practice to seem ultra professional and ultra efficient with letters going out on time and phones being answered quickly etc. This may not happen IF you don’t have as many of the support functions away from the “front” office as you can. There are others of course but the above are pretty much guaranteed to be candidates for outsourcing. Leave in place talking to patients; organising clinics; writing to patients or GPs; checking you know where you’ll be next Tuesday. In other words let the medical secretary do what she does best. Organise your professional life and outsource the rest of the practice. But outsourcing is not necessarily turnover related. Some of the guys only need an hour a week; others need an hour a day; one needs a whole day each week. All are outsourced and all are reporting an increase in the number of patients they see and thereby earning more money.